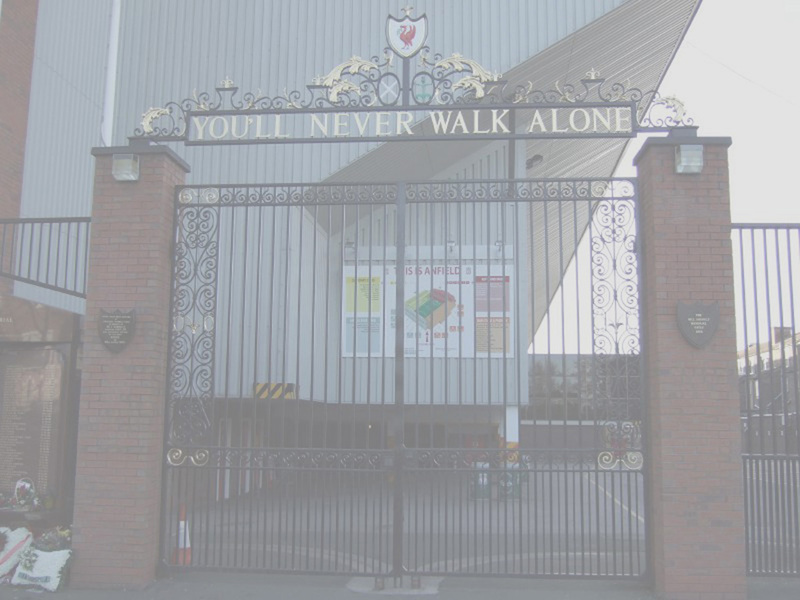 Crownpaints had been the sponsorship of Liverpool since 1983. Stepping in the season 1987-1988, the contract was not renewed and thus it was the last season of Crownpaints sponsorship. For the same grey crossed-neck away shirt used, there existed two versions of sponsor logo - white Crownpaints in beginning of the season and red Crownpaints in the latter. This is a relative rare players shirt as this crossover-neck style away shirt was used in one season only. 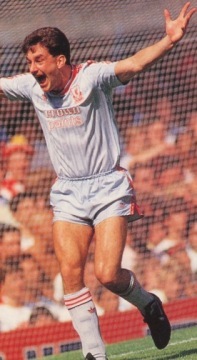 Featured John Aldridge wearing the grey away kit of season 1987-1988 with the white Crownpaints sponsor. 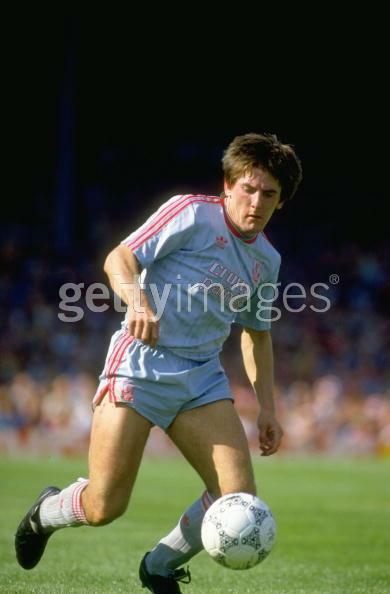 Another picture showing Peter Beardsley wearing a grey away kit with the white Crownpaints sponsor. 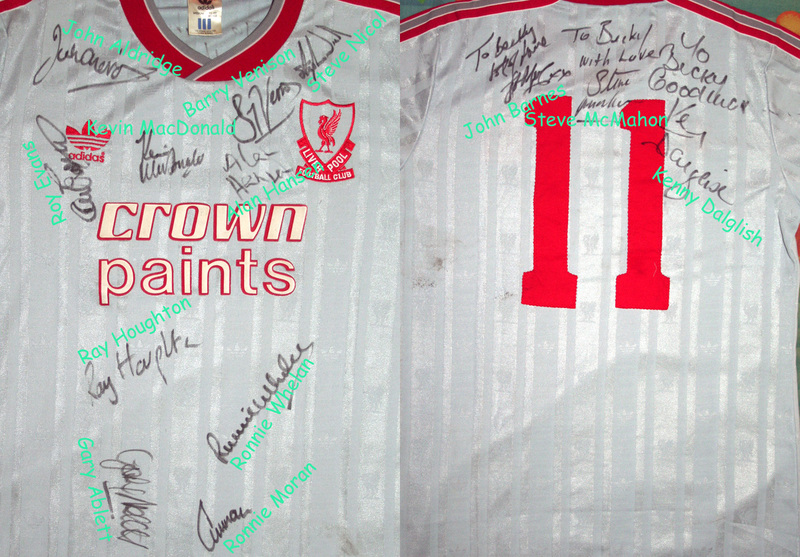 Liverpool 1987-1988 Away Player Shirt - Numbered 11 shirt belongs to Steve McMahon. The silvery grey away shirt is always interesting. For the same crossed-neck style grey strip, there were three different versions - white Crownpaints sponsor in early 1987-1988, red Crownpaints sponsor in mid-late 1987-1988, and red Candy sponsor in season 1988-1989. 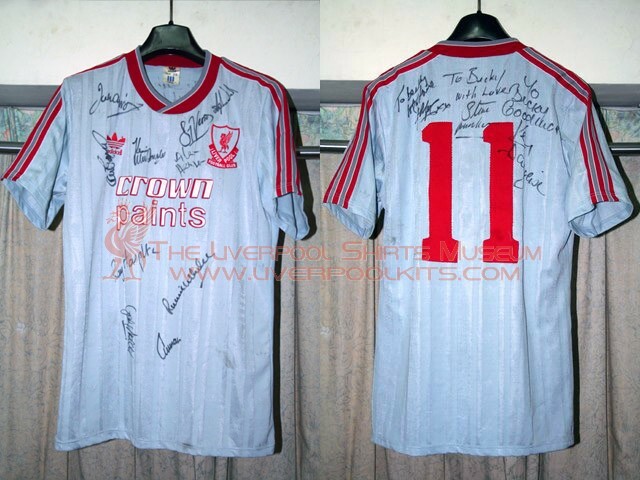 Why were the white Crownpaints sponsor shirts only utilsed in early season of 1987-1988? The answer is simple - "Invisible"!! This is unlike the Mancs' reasoning of wearing invisible shirts resulted in disability to spot on each other, rather the commerical sponsor complained their advertising logo could not be seen because of light-grey and white colour clash. 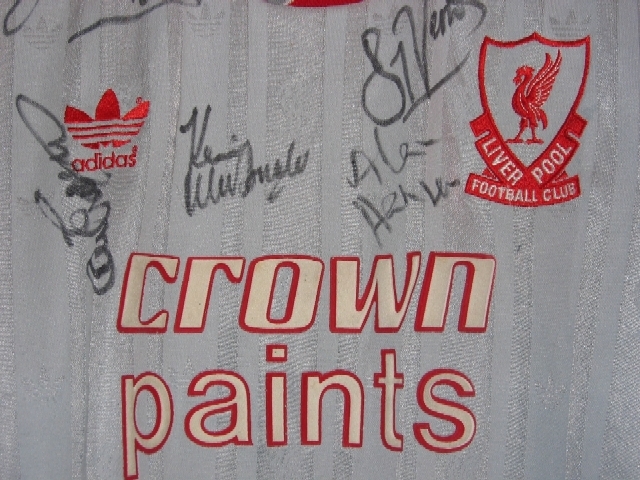 Very soon, all the grey kits in season 1987-1988 were replaced by ones with red Crownpaints. 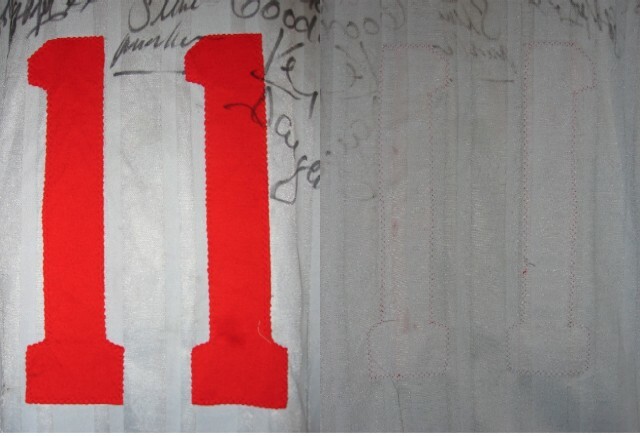 This shirt is personalised to a lady called "Becky", and autographed by the whole team in the front and back side. 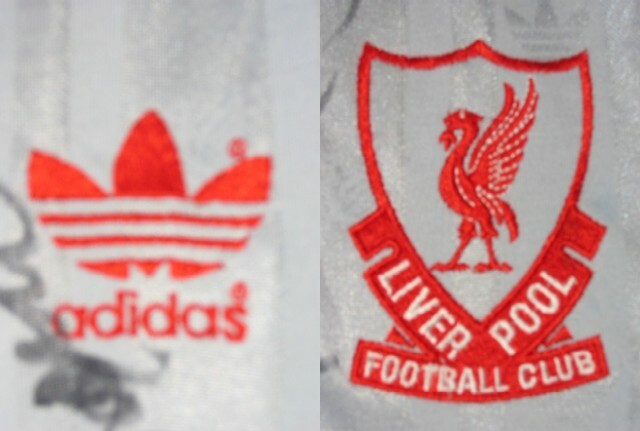 As usual, club crest and manufacturer motif are both embroidered into the shirt for genuine player shirt. Viewing from the inner side, we see the embroidery effect. 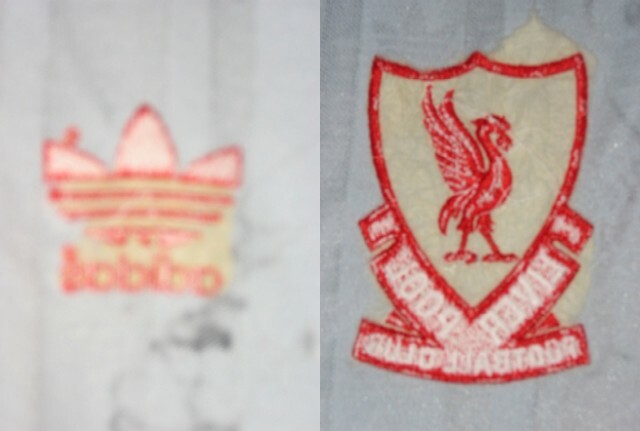 Genuine shirts of the 1980s have machine stitched cloth type numbers.